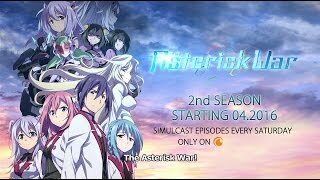 we will take a closer look at the world setting of The Asterisk War! [AST COUNTDOWN] Introducing the Second Keyart! [AST COUNTDOWN] What is "AST COUNTDOWN"? [AST COUNTDOWN] Introducing the Background Art of Rikka - The Academy City on the Water! [AST COUNTDOWN] Introducing the Background Art of Seidoukan Academy! [AST COUNTDOWN] Introducing the Background Art of the Sirius Dome! [AST COUNTDOWN] Introducing the Background Artwork of Seidoukan Academy’s Male Dormitory! [AST COUNTDOWN] Introducing the Background Artwork of the Seidoukan Academy Female Dormitory! 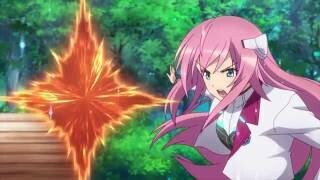 [AST COUNTDOWN] The Asterisk War is Premiering TOMORROW (10/3/2015)! 04.25.2017 Limited & Standard Edition Blu-rays Vol.3 & 4 Now Available! 10.31.2016 Limited & Standard Edition Blu-rays Vol.3 & 4 Pre-Order Now! 10.23.2016 Limited & Standard Edition Blu-rays Vol.1 Now Available!! 06.09.2016 The Festa season begins at Anime Expo® ! 06.06.2016 Limited & Standard Edition Blu-rays Vol.1 & 2 Pre-Order Today! !